The vineyard cooperative—or co-op, if you will—often has a negative connotation in the wine world. While your food co-op gathers goods from local farmers and producers to benefit the greater community, and everyone agrees that cooperation in general is pivotal to a productive working environment, we sometimes think of wine co-ops as large corporations buying up over-cropped grapes and unused (read: unworthy) juice from who knows where to produce a bulk (read: unworthy of our refined palates) wine. But oftentimes, this is not nearly the case. In fact, co-ops can create wonderful wines that act as entryways into the great terroirs of the world without draining your bank account. These are wines that you can buy full cases of for the price of some vigneron’s 750s. Co-ops provide especially great values in difficult vintages—like 2011-present in one of the world’s priciest, most noble regions, Bourgogne. With yields incredibly low and stocks running short, the co-ops are in a position to purchase top tier grapes and will even find the winemakers themselves helping them during the production. It is with this knowledge that Wine Trends is proud to introduce the stunning wines of the Blason de Bourgogne portfolio—Bailly-Lapierre of Cremant de Bourgogne AOC; Vignerons de Buxy of the Cote Chalonnaise; and the venerable La Chablisienne from Chablis AOC. Very few co-ops in the world are as renowned as La Chablisienne. Started in 1923, they continue to make world-class Chardonnay and keep Chablis in the hearts and minds of wine lovers everywhere. They account for 25% of the total production of the Chablis AOC, but this in no way means that they cut corners, over crop, or settle for anything less than absolute varietal correctness of the Chablis terroir. Producing wine from every appellation in the region contributes to their continued expertise. From the Sauvignon Blanc in the outlying St. Bris and the simple but delicious Chardonnay of Petit Chablis AOC all the way to the famous Grand Crus of the region, La Chablisienne creates excellent wines at all levels of the spectrum. 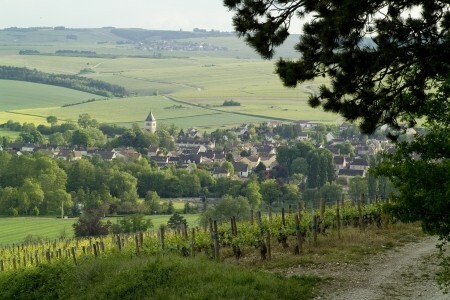 For a region that many think has lost its way over the decades, La Chablisienne continues to prove that, with the right people and the best practices in the vineyard, Chablis can still be revered for its world-class Chardonnay. Look no further than their 2012 1er Cru Fourchaume to see what we’re talking about. This is Chablis at its finest—the Kimmeridgian limestone absolutely shines throughout the tasting experience, marrying nicely with the tart apple, juicy pear, and under-ripe tropical fruit flavors. The acidity is high toned, making it a perfect complement to many dishes, and the finish goes on and on. You will be hard pressed to find another wine with this complexity and structure for this price, let alone a Bourgogne 1er Cru! Definitely ask your favorite retailer or restaurateur about it today! For over 80 years, the 270 grower families of the Vignerons de Buxy have dedicated their efforts to promoting the world-class wines of the Cote Chalonnaise and the Maconnais of Southern Bourgogne. Their wines are clean, balanced, remarkable examples of what can be achieved in the lesser-known regions beyond the Cote d’Or. Throughout every vintage, the Cave works with each of its growers individually, ensuring a consistency in their wines year in and year out. They constantly update and renovate their cellars to remain on the cutting edge of winemaking techniques. With an attention to detail that is second to none, the Cave des Vignerons de Buxy is poised to delight a lot of palates across Ohio! Every wine the Cave offers is delicious, but of special interest are the 2013 Bourgogne Blanc, Cote Chalonnaise, and the 2012 Rouge, Mercury AOC. The Blanc (100% Chardonnay) is a mouthful of green apple and melon fruit with mouthwatering acidity and a food-friendly chalky minerality you usually don’t find in wines at this price point. As for the Mercury—it’s village-level fruit with 1er Cru quality at a ridiculously affordable price. If you want to experience the finesse and elegance of Bourgone without breaking the bank, look no further than this incredible bottle of Pinot Noir. In 1972, in the town of Bailly between Chablis and the Cote d’Or, Bailly-Lapierre began producing bubbly and using their 50-meter deep underground limestone quarries as their caves. Their high-quality grapes led to such stunning wines that in 1975, the Cremant de Bourgogne AOC—the first Cremant appellation in France—was created due to the work they had done! Today, the men and women of Bailly-Lapierre continue to capture the quality, finesse, elegance, and inspiration that their vineyards offer. The 70 families involved with the winery tend to everything from vineyard to cellar. Sustainable farming methods, hand-harvesting, and utmost care for their land all result in a beautiful finished product. Close your eyes and you would guess this is Champagne. Acidity and balance are the hallmarks of their style across their varietals. Whether it’s Brut, Blanc de Noirs, or Pinot Noir Rose, the sparklers of Bailly-Lapierre represent hallmarks of the region and the style. Get some in your glass today!